The concept of the loan is as old as civilization itself. Looking back thousands of years, merchants would arrange to lend grain or other commodities to farmers or other traders in exchange for their future yields or wares brought in from neighboring villages. The charging of interest on these loans has a deep and complex history, with changes in interest rates and government support or restrictions on interest being a driving force of economies and armies across time. In antiquity, another difficulty any merchant, farmer, or trader would experience was the lack of single currency across even relatively small regions of the world. Accordingly, the practice of changing money in addition to lending began to be formalized in temples across the Mediterranean. In 14th century Italy, the first private institutions specifically established for such services started to spring up in the affluent cities of Venice and Florence. These were to be the first banks, most notable being the Medici bank. Over the last 600 years, banking practices evolved and expanded to include a host of solutions; servicing private individuals, corporate entities, and public sector institutions. Banks lend money to individuals and companies, provide repositories for cash savings, facilitate the raising of investment capital, and provide a host of services to the economy and society. However, not all banks are created equal, and not all banks engage in the same functions. In fact, recent regulations have mandated that banks ring-fence off certain banking functions from other parts of their business. This aims to protect customers from risk in that if there is an issue within one division of the bank, the contagion will not spread to impact other banking divisions. For example, the separation of the higher-risk investment banking operations from the day-to-day functions of retail banking. Through media coverage of this famous separation of retail from investment banking, the general public has been educated on, or at least made aware of, the differences between investment banking and retail banking. However, behind all of this still remains a largely unpublicized function of banks that also sits across the table from the everyday retail banking with which most are familiar; the custodian bank. consists of the functions that the typical person would engage with on a daily basis, or throughout the course of their life. For example, retail banks accept deposits which pay a low rate of interest (famously low rates in Japan). They also provide various forms of retail loans such as home mortgages, business loans, or credit cards. Think of them as your neighborhood bank; although retail banks can also be some of the largest institutions in the world. As is evident, a custodian bank focuses on the more boring and simple functions that a bank may provide. The most common and arguably the primary function of the custodian bank is the holding and safeguarding of financial assets. For example, if you own shares in stock or a fund, where are those shares held? Do you physically hold share certificates in your home? If not, one place they are likely to reside is on record with a custodian. This provides a key insight into how a custodian is in stark contrast to a retail bank; one holds financial “paper” assets, the other holds your cash. While this sounds similar, it is fact very different, and for important reason. Cash held on deposit with a retail bank is, in principal, money that is at risk. An example of this type of arrangement would be the cash you likely have on deposit with your bank, and can access with your ATM card. From a legal standpoint, cash on deposit with a bank is in fact at that moment the bank’s money. It is a loan from you to the bank, a loan which you can withdraw at any time; and for this the bank pays you a rate of interest. Although in Japan the interest on deposit accounts is famously low, it is usually not nothing. Because this is technically loan from you to the bank, this means that the cash is on the bank’s balance sheet. From this cash on deposit, the bank then performs the usual banking functions such as lending for home mortgages or providing business loans. However, in the event of a crisis, if the bank were to go into insolvency, the depositor’s cash would be at risk. What this means is, in the event the bank is unable to pay its own loans, the creditors could go after your cash held on deposit with the bank. If the bank goes into bankruptcy, in theory the depositors would be unable to receive any of their cash back, because the bank would have no cash to return to them. In such an event, this is where government-backed depositor’s insurance programs would kick in to, hopefully, reimburse depositors. In Japan, the DICJ (Depositor’s Insurance Corporation of Japan) claims to reimburse depositors up to 10 Million JPY on interest-bearing deposit accounts. Any cash on deposit above the 10 Million JPY mark would be forfeited; and in the event of a major banking crisis which would trigger the need for the DICJ to step in, it is possible that even the DICJ would be unable to reimburse the full 10 Million JPY (which is why the regulations stipulate “up to” 10 Million JPY). This is in stark contrast to how a custodian bank is set up. As illustrated, a custodian bank is not in the business of taking on investment risk or credit risk. Accordingly it is not exposed to the same possibility of being driven into insolvency due to a market crash the same way a retail bank would be. Custodian banks simply provide services with predictable costs to the bank, and charge fees for these services. This also forms the basis for how a custodian bank is different from a retail bank. With a custodian, you pay the bank for the service of safeguarding your assets. With a retail bank deposit account, the bank pays you interest in exchange for the ability to loan your money out to other people. Because of this key difference, in the unlikely event that a custodian bank goes into insolvency, the client assets are not on the custodian’s balance sheet (the way they are on the retail bank’s balance sheet). This means that a custodian’s creditors have no legal claim to your assets held in custody with the bank, and as such they are “ring-fenced” and protected from any bankruptcy proceedings. An easy way to think of this contrast between a retail bank function and the custodian is to visualize the interior of a stereotypical neighborhood bank. 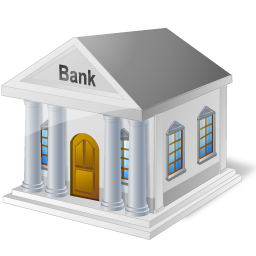 The retail bank is the counter with the teller where you can make deposits, receive interest, and take money out of an ATM. The custodian is over on the other side of the bank with the big safe and the wall-sized door. You have to pay a monthly fee to rent out a space in the safe, but you can put anything in it: cash, gold, share certificates, family heirlooms, etc. If the bank becomes insolvent, the ATM could shut down and no more money comes out. However, over at the custodian side you still have the key to your safe deposit box where you and only you can go and withdraw whatever is inside.